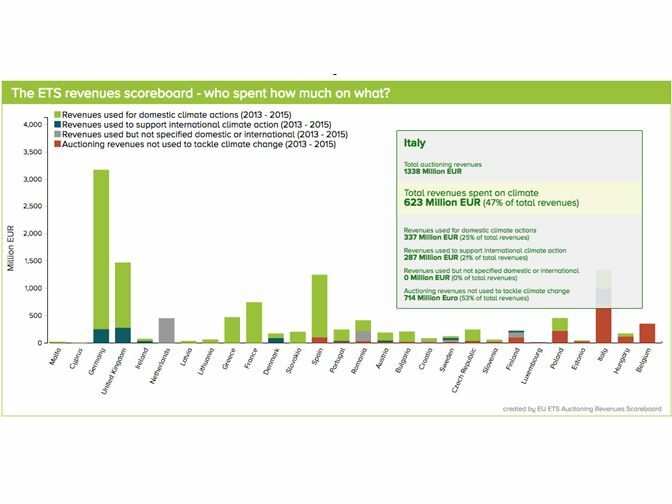 Ecologic Institute developed an easy-to-use web tool that displays ETS auctioning revenue data for the EU Member States since the beginning of the third trading period in 2013. The intuitive and navigable web interface is designed to be used by the public as well as experts and academics and allows the user to visualize and compare revenues by country and year using one or more graphical representations. The tool incorporates multiple indicators including type of use (e.g. cross-cutting actions, promotion of renewable energy, energy efficiency etc. ), share used in/outside the EU, actions in/outside the EU and channels used to support developing countries.